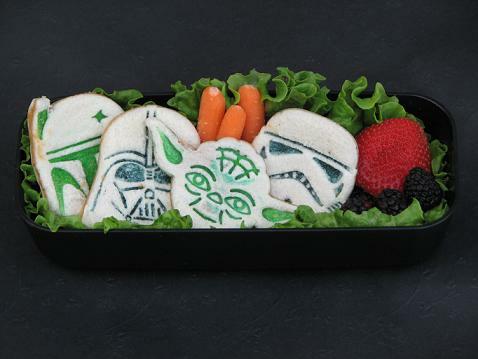 Bento for Kidlet: Star Wars Sandwich Bento! Thanks to Bridget from Bake at 350 for alerting us to the amazing Star Wars cookie cutters now available at Williams Sonoma! I don't normally get to go to WS because it is at the mall that is farther away. However, last night I had to head to the farther mall to pick up a Race for the Cure shirt for Kidlet's gramma. We ended up in both the LEGO store and WS lol. These cookie cutters are amazing tho....I cannot wait to try making actual cookies with them! The neighbor boys are very excited about these new cookie cutters! Bento contains 4 Star Wars peanut butter sandwiches. To give the faces color I just lightly rubbed my food coloring maker on to the impression of the cookie cutter and then pressed down. Alongside are carrots, blackberries, and strawberry. Pretzels hide under some of the sandwiches. Omg, I have to get these, hehe! Cool! So cool! Those made awesome sandwiches! If my big boys ate sandwiches those would be a must-have for sure! YODA!!!!! Why oh why can't they have WS here!?!?!? Ha, what an awesome idea! Very clever to color the cutters that way. Coolest.Lunch.Ever. Rubbing the food coloring on the cutters....genius! My kid would go crazy for this lunch! I came across those this past weekend at WS by chance and bought them immediately. My husband and son love,love, love Star Wars. I will have to try making them! Thanks for sharing! How very cool! Where does one find a food coloring marker? We bought the pancake molds and use those for all three.